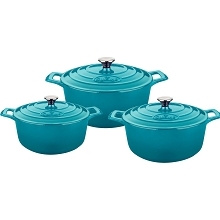 La Cuisine's Mini Round 4 In. 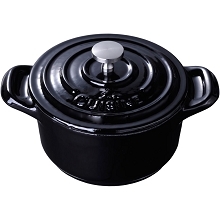 Cast Iron Casserole is perfect for commercial establishments or when you want to create an extra bit of wow when entertaining friends and family. 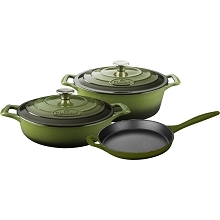 The 10-ounce capacity is ideal for single-serving sides, souffles or desserts. 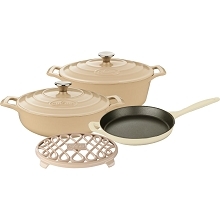 La Cuisine's cast iron cookware is crafted using sand molds, which are used only once, forging a lighter product with a very fine enamel finish that is truly unique. 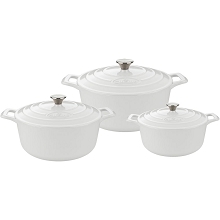 Wonderfully versatile, La Cuisine's mini round casseroles are suited to the oven and all cooktops, including induction. Food heats through evenly and remains hot until served. The non-toxic, matte black enamel interior surface is scratch-resistant, stain-resistant, gives excellent food release that improves through continued use, and is simple to clean – just wash in warm water. 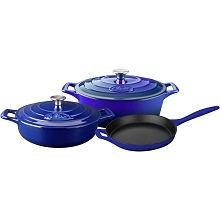 Whatever your skill level, La Cuisine is perfect for no-fuss, healthy cooking and looks great as it goes straight from cooking on the stovetop or in the oven to serving at the table or buffet (our trivets, sold separately, are recommended for table/buffet use). La Cuisine's PRO Round 5 Qt. 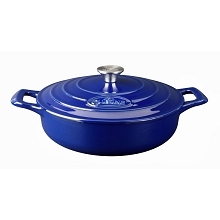 Cast Iron Casserole can be used to rustle up all sorts of mouth-watering dishes cooked on the stovetop or in the oven. 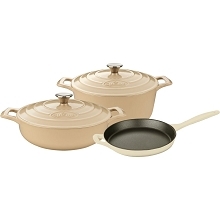 La Cuisine's PRO cast iron cookware is crafted using sand molds, which are used only once, forging a lighter product with a very fine enamel finish that is truly unique. 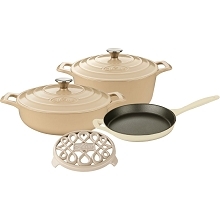 Wonderfully versatile, La Cuisine's PRO round casseroles are suited to the oven and all cooktops, including induction. Food heats through evenly and remains hot until served. 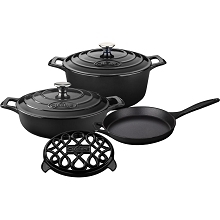 The non-toxic, matte black enamel interior surface is scratch-resistant, stain-resistant, gives excellent food release that improves through continued use, and is simple to clean – just wash in warm water. 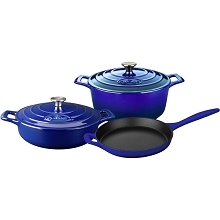 Perfect for professional and domestic cooks alike, La Cuisine PRO gives you no-fuss, healthy cooking that looks great as it goes straight from cooking on the stovetop or in the oven to serving at the table or buffet (our trivets, sold separately, are recommended for table/buffet use). La Cuisine's Shallow Cast Iron Roasting Pan is great for all types of meat, vegetable and fish dishes. 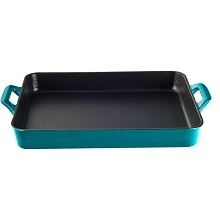 Low slung sides gives you perfect roast potatoes and sure-grip, wide-angle wedge handles provide comfort and stability as you carry them to the table. 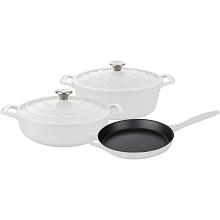 La Cuisine's cast iron cookware is crafted using sand molds, which are used only once, forging a lighter product with a very fine enamel finish that is truly unique. 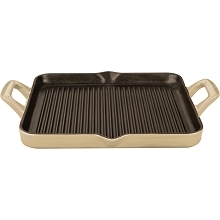 Wonderfully versatile, La Cuisine's shallow roasting pan is suited to the oven and all stovetops, including induction. 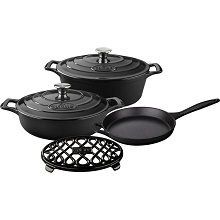 The scratch-resistant, stain-resistant, non-toxic, matte black enamel interior surface gives excellent food release that improves through continued use, and is simple to clean – just wash in warm water. 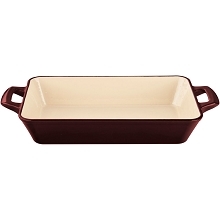 La Cuisine's Mini Rectangular 7 In. Cast Iron Casserole is perfect for commercial establishments or when you want to create an extra bit of wow when entertaining friends and family. 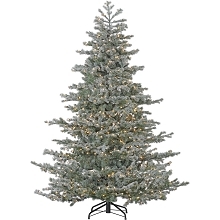 The 22-ounce capacity is ideal for single-serving entrees or double-serving sides. 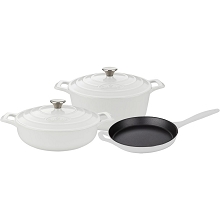 La Cuisine's cast iron cookware is crafted using sand molds, which are used only once, forging a lighter product with a very fine enamel finish that is truly unique. 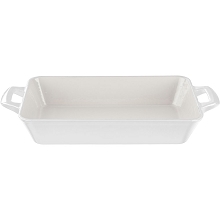 Wonderfully versatile, La Cuisine's mini rectangular casseroles are suited to the oven and all cooktops, including induction. Food heats through evenly and remains hot until served. 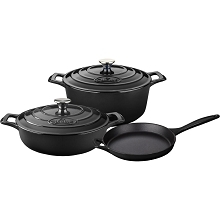 The non-toxic, matte black enamel interior surface is scratch-resistant, stain-resistant, gives excellent food release that improves through continued use, and is simple to clean – just wash in warm water. 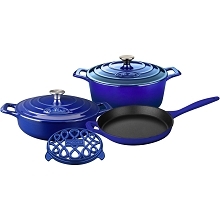 Whatever your skill level, La Cuisine is perfect for no-fuss, healthy cooking and looks great as it goes straight from cooking on the stovetop or in the oven to serving at the table or buffet (our trivets, sold separately, are recommended for table/buffet use). 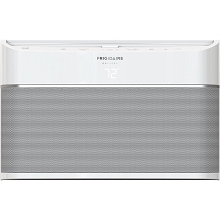 La Cuisine's PRO Round 3.7 Qt. 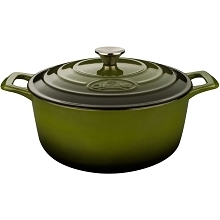 Cast Iron Casserole can be used to rustle up all sorts of mouth-watering dishes cooked on the stovetop or in the oven. 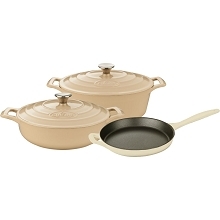 La Cuisine's PRO cast iron cookware is crafted using sand molds, which are used only once, forging a lighter product with a very fine enamel finish that is truly unique. 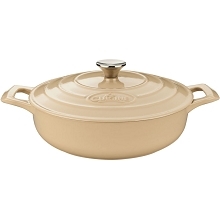 Wonderfully versatile, La Cuisine's PRO round casseroles are suited to the oven and all cooktops, including induction. Food heats through evenly and remains hot until served. 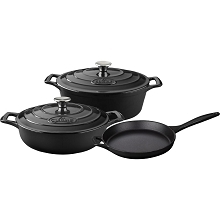 The non-toxic, matte black enamel interior surface is scratch-resistant, stain-resistant, gives excellent food release that improves through continued use, and is simple to clean – just wash in warm water. 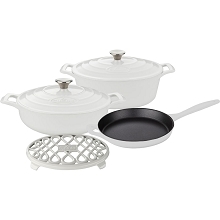 Perfect for professional and domestic cooks alike, La Cuisine PRO gives you no-fuss, healthy cooking that looks great as it goes straight from cooking on the stovetop or in the oven to serving at the table or buffet (our trivets, sold separately, are recommended for table/buffet use). La Cuisine's PRO 4 Pc. 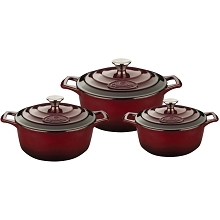 Round Cast Iron Casserole Set, in ruby, includes the 2.2-quart and 3.7-quart casseroles with lids. La Cuisine's PRO cast iron cookware is crafted using sand molds, which are used only once, forging a lighter product with a very fine enamel finish that is truly unique. 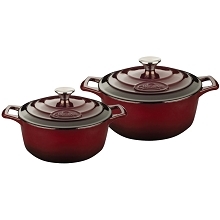 Wonderfully versatile, La Cuisine's PRO round casseroles are suited to the oven and all cooktops, including induction. 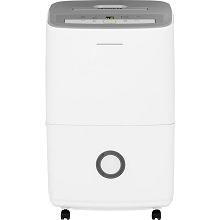 Food heats through evenly and remains hot until served. 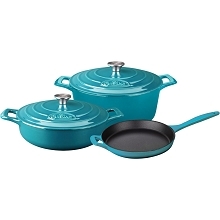 The non-toxic, matte black enamel interior surface is scratch-resistant, stain-resistant, gives excellent food release that improves through continued use, and is simple to clean – just wash in warm water. 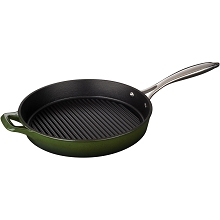 Perfect for professional and domestic cooks alike, La Cuisine PRO gives you no-fuss, healthy cooking that looks great as it goes straight from cooking on the stovetop or in the oven to serving at the table or buffet (our trivets, sold separately, are recommended for table/buffet use). 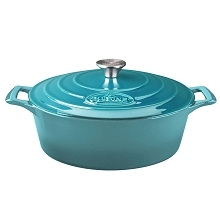 La Cuisine's PRO Saute 3.75 Qt. Cast Iron Casserole provides a beautiful presentation for rice or potato dishes. 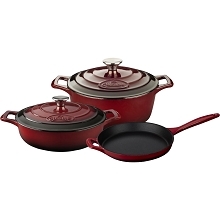 La Cuisine's PRO cast iron cookware is crafted using sand molds, which are used only once, forging a lighter product with a high gloss enamel finish that is truly unique. 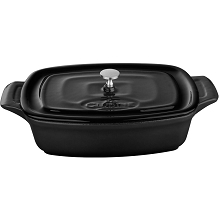 Wonderfully versatile, La Cuisine's PRO saute casseroles are suited to the oven and all cooktops, including induction. Food heats through evenly and remains hot until served. 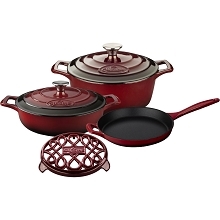 The non-toxic, matte black enamel interior surface is scratch-resistant, stain-resistant, gives excellent food release that improves through continued use, and is simple to clean – just wash in warm water. 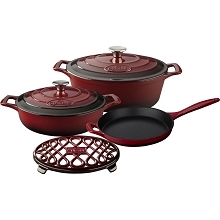 Perfect for professional and domestic cooks alike, La Cuisine PRO gives you no-fuss, healthy cooking that looks great as it goes straight from cooking on the stovetop or in the oven to serving at the table or buffet (our trivets, sold separately, are recommended for table/buffet use). La Cuisine's Round 6.5 Qt. 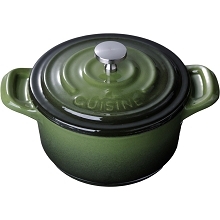 Cast Iron Casserole can be used to rustle up all sorts of mouth-watering dishes cooked on the stovetop or in the oven. 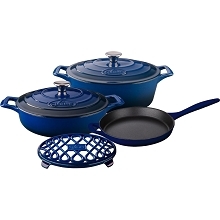 Its cast iron is crafted using sand molds, which are used only once, forging a lighter product with a very fine enamel finish that is truly unique. 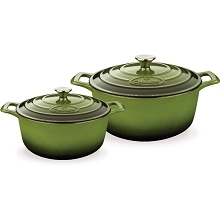 Wonderfully versatile, La Cuisine's PRO round casseroles are suited to the oven and all cooktops, including induction. 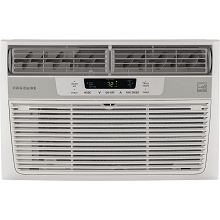 Food heats through evenly and remains hot until served. The non-toxic, matte black enamel interior surface is scratch-resistant, stain-resistant, gives excellent food release that improves through continued use, and is simple to clean – just wash in warm water. 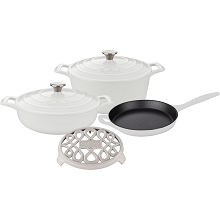 Perfect for professional and domestic cooks alike, La Cuisine PRO gives you no-fuss, healthy cooking that looks great as it goes straight from cooking on the stovetop or in the oven to serving at the table or buffet (our trivets, sold separately, are recommended for table/buffet use). 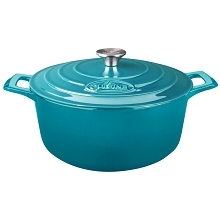 La Cuisine's PRO Oval 6.75 Qt. 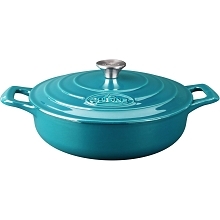 Cast Iron Casserole can be used to rustle up all sorts of mouth-watering dishes cooked on the stovetop or in the oven. 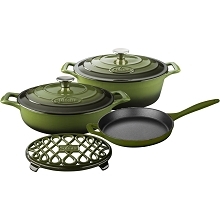 La Cuisine's PRO cast iron cookware is crafted using sand molds, which are used only once, forging a lighter product with a very fine enamel finish that is truly unique. 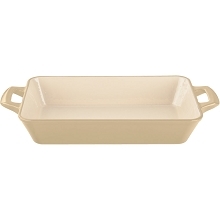 Wonderfully versatile, La Cuisine's PRO oval casseroles are suited to the oven and all cooktops, including induction. 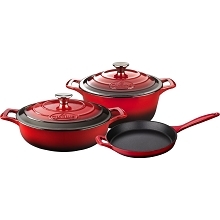 Food heats through evenly and remains hot until served. 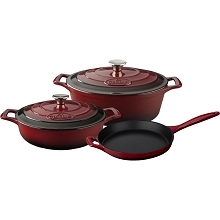 The non-toxic, matte black enamel interior surface is scratch-resistant, stain-resistant, gives excellent food release that improves through continued use, and is simple to clean – just wash in warm water. Perfect for professional and domestic cooks alike, La Cuisine PRO gives you no-fuss, healthy cooking that looks great as it goes straight from cooking on the stovetop or in the oven to serving at the table or buffet (our trivets, sold separately, are recommended for table/buffet use). 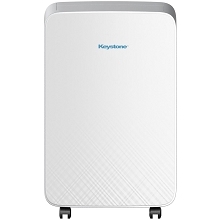 La Cuisine's PRO 6 Pc. Round Cast Iron Casserole Set includes the 2.2-quart, 3.7-quart and 5-quart casseroles with lids. 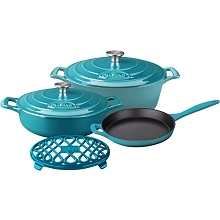 La Cuisine's PRO cast iron cookware is crafted using sand molds, which are used only once, forging a lighter product with a high gloss enamel finish that is truly unique. 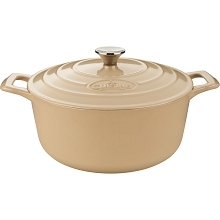 Wonderfully versatile, La Cuisine's PRO round casseroles are suited to the oven and all cooktops, including induction. Food heats through evenly and remains hot until served. 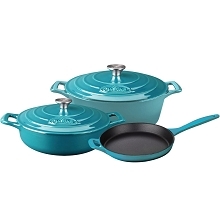 The non-toxic, matte black enamel interior surface is scratch-resistant, stain-resistant, gives excellent food release that improves through continued use, and is simple to clean – just wash in warm water. Perfect for professional and domestic cooks alike, La Cuisine PRO gives you no-fuss, healthy cooking that looks great as it goes straight from cooking on the stovetop or in the oven to serving at the table or buffet (our trivets, sold separately, are recommended for table/buffet use). 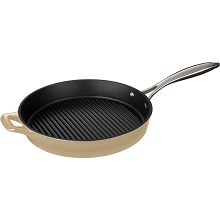 La Cuisine's Saute 3.75 Qt. Cast Iron Casserole provides a beautiful presentation for rice or potato dishes. 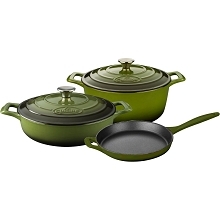 La Cuisine's cast iron cookware is crafted using sand molds, which are used only once, forging a lighter product with a high gloss enamel finish that is truly unique. 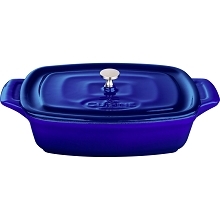 Wonderfully versatile, La Cuisine's saute casseroles are suited to the oven and all cooktops, including induction. Food heats through evenly and remains hot until served. The non-toxic cream enamel interior surface gives excellent food release that improves through continued use, and is simple to clean – just wash in warm water. 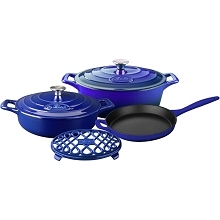 Whatever your skill level, La Cuisine is perfect for no-fuss, healthy cooking and looks great as it goes straight from cooking on the stovetop or in the oven to serving at the table or buffet (our trivets, sold separately, are recommended for table/buffet use). La Cuisine's PRO Round 2.2 Qt. Cast Iron Casserole can be used to rustle up all sorts of mouth-watering dishes cooked on the stovetop or in the oven. 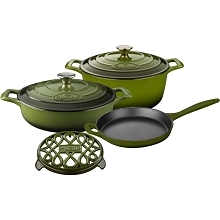 La Cuisine's PRO cast iron cookware is crafted using sand molds, which are used only once, forging a lighter product with a very fine enamel finish that is truly unique. 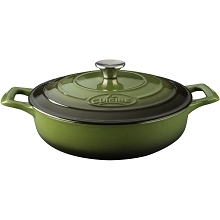 Wonderfully versatile, La Cuisine's PRO round casseroles are suited to the oven and all cooktops, including induction. Food heats through evenly and remains hot until served. 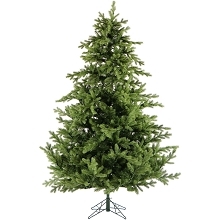 The non-toxic, matte black enamel interior surface is scratch-resistant, stain-resistant, gives excellent food release that improves through continued use, and is simple to clean – just wash in warm water. Perfect for professional and domestic cooks alike, La Cuisine PRO gives you no-fuss, healthy cooking that looks great as it goes straight from cooking on the stovetop or in the oven to serving at the table or buffet (our trivets, sold separately, are recommended for table/buffet use).